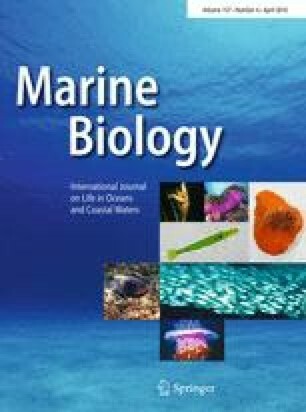 To elucidate the life history of neustonic animals, growth and reproductive patterns were investigated in the hermaphroditic pedunculate barnacle Lepas anserifera in field and laboratory experiments in Wakayama, western Japan from 2006 to 2008. The effects of temperature (19, 24 or 29°C) and food availability (once or twice a week) on growth and reproduction were also studied in the laboratory. The barnacles grew and matured rapidly, especially in the field: individuals on the average grew from 3 mm to more than 12 mm in capitulum length within 15 days and some were brooding. High temperature and high food availability resulted in greater growth. High temperature also resulted in earlier maturation of both testes and ovaries, whereas the effect of food availability was less clear. The rapid growth and maturation, together with earlier maturation at higher temperatures, may be an adaptation to ephemeral floating objects to which they attach. We thank K. Wada, H. Sato, the editor and reviewers for their valuable comments, Y. Yamamoto, K. Okita, S. Urano, Y. Kitano, M. Matsumura and S. Serizawa for technical advice and help. The authors declare that they have no conflict of interest.